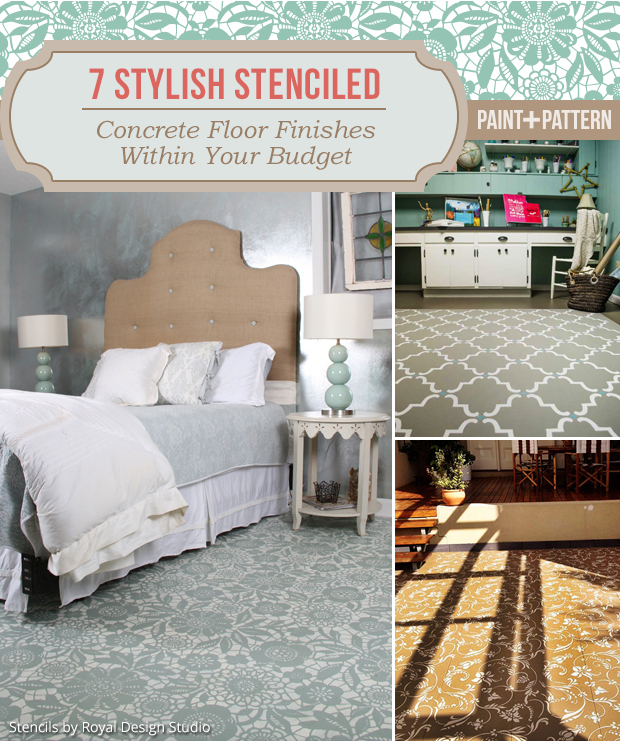 Home / All / 7 Stylish Stenciled Concrete Floor Finishes within Your Budget! When you think of concrete floors do you think boring, plain, and… blah? Think again! Stenciling concrete is an inexpensive way to add style to an otherwise utilitarian floor. A stenciled concrete floorscan also help you hide imperfections, create a lovely focal point in your home, or just add a dose of beauty to your space for very little cost. Looking for some floor makeover inspiration? Here are 7 stenciled concrete floor finishes that will make your jaw drop! Make sure to read to the end for recommendations on floor prep and the best paint products to use for stenciled concrete! Dana and Brooks of Bella Tucker Finishes wanted a major floor renovation to their guest bedroom makeover. They turned to stenciling the concrete because carpet was too underwhelming. 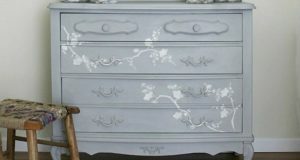 They happily ripped out the carpeting and stenciled our popular Skylar’s Lace Floral Stencil with Old White and Duck Egg Blue Chalk Paint® decorative paint by Annie Sloan. They then top coated the floor with a flat varnish. 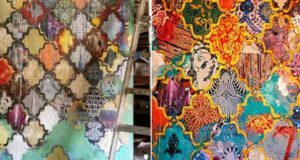 Be sure to check out our full post on their stenciled concrete floor project – we chalk it up to another stencil success! 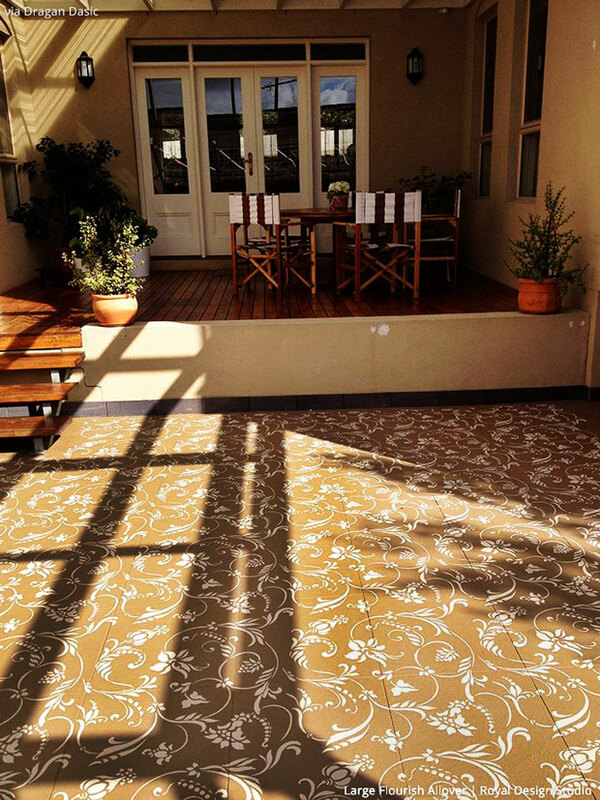 This serene and sunny outdoor porch has added flourishes with the Large Allover Flourish Stencil in a two-tone neutral color combination. This taupe color scheme paired with the flower stencil pattern works great for a natural look that blends beautifully with the outdoors. 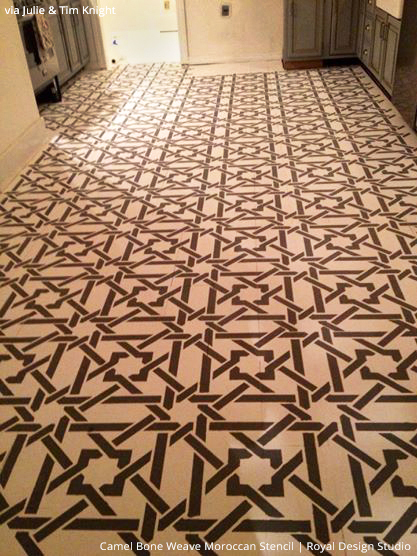 Our creative customer Dragan did a fantastic job with this stenciled concrete floor finish, didn’t he? 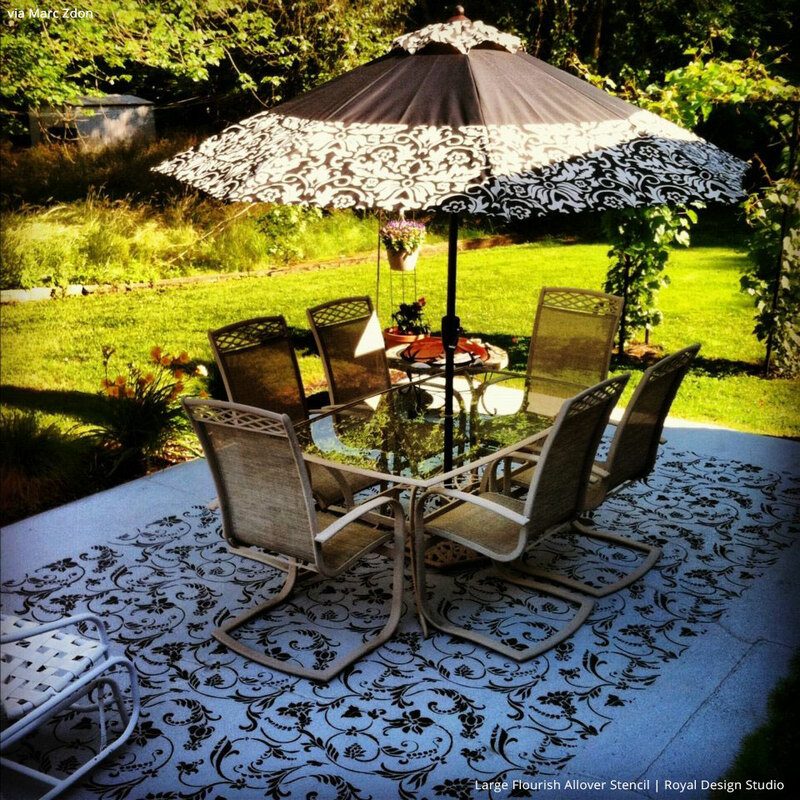 Here’s another way to use the same stencil on a concrete porch. This time Marc Zdon painted our Large Flourish Allover Stencil over an Annie Sloan Chalk Paint base coat. 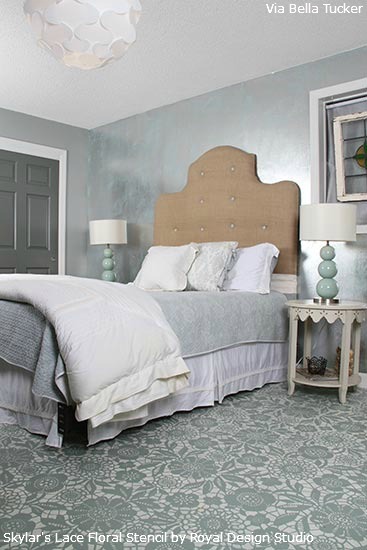 Stenciled concrete floors are so versatile – you can choose which ever paint colors best suite your area! For the Love Creations was tired of her boring cement studio floor with random marks and stains. What she needed was a detailed design that not only masked imperfections but is also visually interesting and ultimately inspiring! By using our Silk Road Suzani Stencil, Chalk Paint® by Annie Sloan, and water-based sealer, she could drag furniture across it and get lost in more paint projects without having to worry about marking up her new stenciled concrete floor. Tired of looking at only plain concrete floors? Farm Fresh Vintage Finds wanted the first thing she sees when she gets home is a pretty porch. So she turned to stencils to paint pattern on her concrete floor. The curvy details of our Raj Trellis Indian Stencil painted with Chalk Paint® decorative paint in Pure White did just the trick! 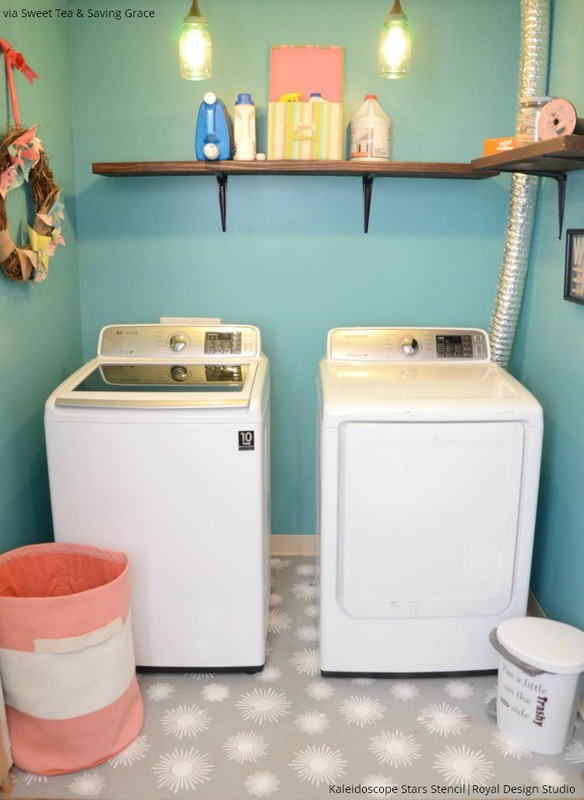 Don’t forget about one of the most overlooked rooms in your home – the laundry room! Sweet Tea and Saving Grace had had enough of the peeling linoleum and orange walls in this little space. 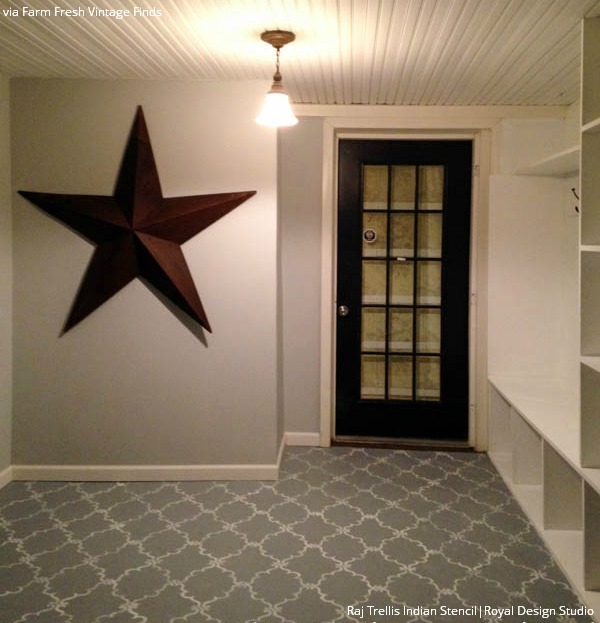 She ripped out the linoleum to expose the concrete and stenciled a modern pattern with our Kaleidoscope Stars Stencil. She finished off the room with new paint, shelving, and appliances. Wow, what a fresh stenciled concrete floor transformation! Look at this fabulous stenciled concrete floor finish that our creative customers Julie and Tim did! 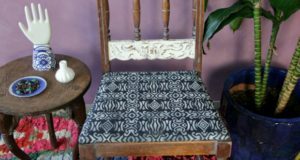 They used Graphite and Old White Chalk Paint by Annie Sloan, our Camel Bone Weave Moroccan Stencil, and Annie Sloan’s water-based floor lacquer to seal the deal! Make sure that your concrete surface is totally clean and free from dust, dirt, grease and any adhesive residue. If you have removed carpet or linoleum from you concrete floor and are left with some adhesive residue, Franmar makes an amazing soy-based mastic remover that is easy to use and environmentally friendly. Thoroughly clean your concrete surface. We like to use clean concrete with Simple Green. Use a scrub brush to get into the pores and rinse multiple times. Use a wet/dry Shop Vac to vacumm up excess water and let the concrete surface dry out well. Chalk Paint® by Annie Sloan is easy to use, both for base coating and stenciling. It covers well and dries fast. For interior projects seal the Chalk Paint® with two coat of Annie Sloan Lacquer. This low solid, water-based topcoat combined with Chalk Paint® creates a highly durable floor surface that will last for many years! Top coating is NOT recommended for exterior projects. Simply let the Chalk Paint® cure for a week and it will be quite durable. If you don’t want to go the Chalk Paint® route, both Benjamin Moore and Sherwin Williams make high quality floor and porch paint. DIY blogging diva Mandi Gubler of Vintage Revivals has a great post that walks you through her process for painting concrete floors with Sherwin Williams paint products. 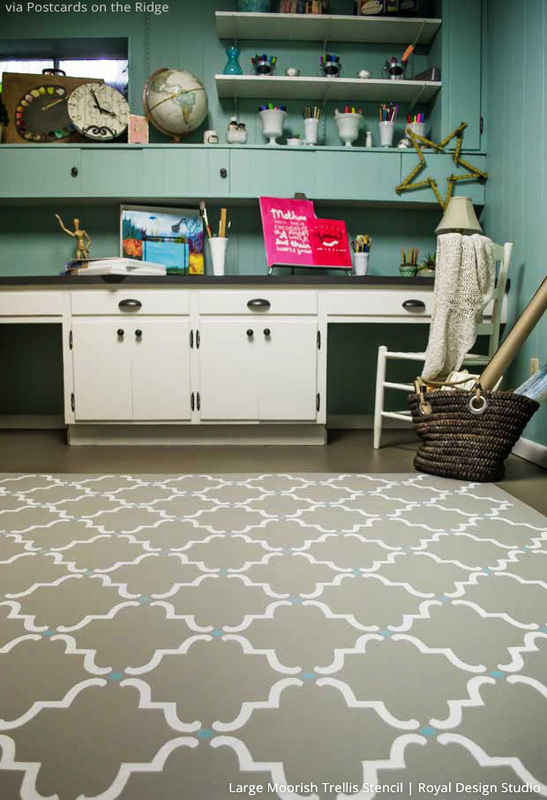 Are you floored by these stenciled concrete floor tips and ideas? 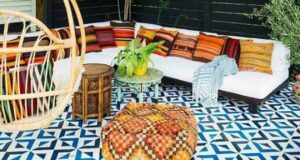 You can find even more floor stenciling ideas on our Stenciled and Painted Floors Pinterest board and on our Off the Wall-Stenciled Floors and Ceilings posts here on Paint + Pattern. Now it’s time to stencil your own! We love to share your beautiful stencil projects with our readers! Email us at projects@royaldesignstudio.com, share them on our Facebook Page, or Instagram your Royal Design Studio stencil projects and tag us with #royaldesignstudio. Hi. I love stenciled floors. they look amazing. I want to know if you can tell me how to paint but on plywood floors. its for inside my house. actually my living room. please let me know. I want to do this project ASAP. Thank you. Has anyone used a basic water based wall paint on concrete? I’m wanting a worn weathered look and I’m trying to use up old leftover paint?